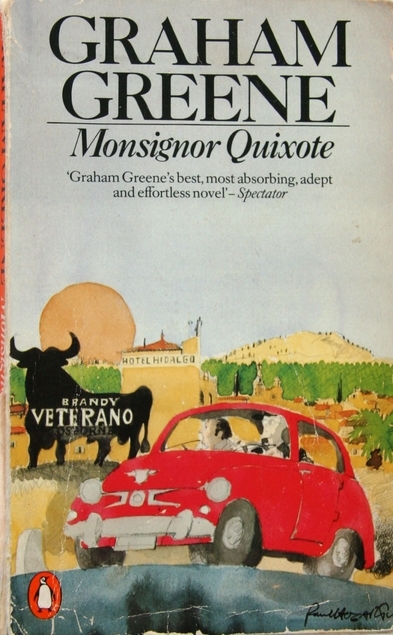 Graham Greene, Monsignor Quixote, London: Penguin Books, 1982. Graham Greene’s modern take on Don Quixote made me laugh out loud. The way simple parish priest Father Quixote becomes a Monsignor is delightfully unbelievable. With a vague ideathat he is like his ancestor Don Quixote, the new Monsignor sets out on adirectionless road-trip with deposed Communist mayor ‘Sancho’ Panza. He nameshis ancient Seat motor car Rocinante after Don Quixote’s steed. Fortified by a few sausages and a great deal of wine of La Mancha, the priest and the mayor, old friends and sparring partners, find themselves hilariously tilting at the Guardia Civil, the modern equivalent of windmills. The two friends discuss faith and communism, friendship and authority, and sleep off the wine. The exploration of these deep topics is playful but insightful. Greene’s writing is lucid and engaging. I don’t know how I missed this, Greene’s ‘best novel’ according to the Spectator, but it was great fun.